More inmates at HMP Edinburgh have been caught with illegal mobile devices than anywhere else in Scotland in the last year, new figures have revealed. At least 60 phones and SIM cards have been retrieved from convicts by guards at ‘Saughton’ between March 2017 and February 2018, despite a Scottish Prison Service (SPS) crackdown on devices being smuggled into prisons. The figures, made available through a freedom of information request, found a rise in the number of handsets seized at eight of Scotland’s 15 prisons over a the last year. Prison officers retrieved an average of one device every six days from the 861 inmates at the maximum security HMP Edinburgh during that period, 15 more than Addiewell and almost 30 more than Perth. The findings come despite a raft of new measures introduced towards the end of last year aimed at reducing the number of illicit devices held by convicts. Justice secretary Michael Matheson announced a series of new ‘telecommunications restrictions orders’ in November, including installing technology in prisons to block phone signals. The overall number of devices confiscated fell slightly in the same period, dropping from 275 in 2016-17 to 273 in 2017-18. 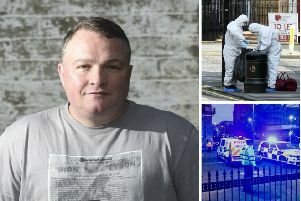 However, in October, the Evening News revealed callous killers who murdered delivery driver Simon San in a horrifying racist attack back in 2010 had posted photographs from their cells taken with a mobile phone they had smuggled inside. Guards found two devices belonging to vile thugs John Reid and Michael Roberts after the pair posted a series of brazen photographs on social media showing them posing in a sink. The incident reportedly prompted officials to move Reid to an alternative prison to keep him away from Roberts. Seven prisons in Scotland, including Barlinnie, Inverness, Kilmarnock, Perth and Shotts saw a drop in the amount of handsets seized. At Addiewell, guards confiscated 45 devices from inmates, almost three times the 17 found the previous year, while at Polmont, officers seized 13 devices from inmates in the last 12 months, compared to two in the 16-17 period.